Interested in these clinical trials? To find out more about the AMAZE or Amulet trials at Emory, please call Emory Health Connection, 404-778-7777. Emory Healthcare has screening centers across the Atlanta area to help diagnose abnormal heart rhythms, or arrhythmias. To learn more about arrhythmia screening, treatment and heart rhythm management services at Emory, please call 404-778-7777 or click here. Researchers at the Emory Heart & Vascular Center are the first in Georgia to participate in two clinical trials evaluating new treatment options for patients with atrial fibrillation (AFib). Both trials, commonly referred to as the AMAZE and Amulet trials, are assessing methods to close off the heart’s left atrial appendage (LAA), a muscular pouch connected to the left atrium of the heart. In some patients with AFib, the LAA does not contract effectively and can become a source of stroke-causing blood clots. The LAA may also be a source of abnormal electrical activity that triggers AFib. AFib is a quivering or irregular heartbeat (arrhythmia) that can lead to stroke, as well as heart failure and other heart-related complications in the 2.7 million Americans it affects. The AMAZE clinical trial is evaluating a new treatment approach that combines catheter ablation with the use of a device called the LARIAT Suture Delivery Device to close off the heart’s LAA. The LARIAT is a permanent, non-surgical option for LAA closure that uses remote suture delivery to close the LAA from the outside of the heart. Catheter ablation, a common treatment for AFib, is a technique used to destroy small areas in the heart that may be causing rhythm issues by sending electrical (or sometimes cold) energy to the problem area. The randomized, controlled aMAZE trial is enrolling 600 persistent and/or longstanding persistent AFib patients who are candidates for pulmonary vein isolation (PVI) catheter ablation. The objective of aMAZE is to determine if the LARIAT procedure, plus a PVI ablation, will lead to a reduced incidence of recurrent AFib compared to PVI alone. During the LARIAT procedure, catheters are used to deliver a suture loop, slip it around the LAA, and tighten it to close off the LAA. This isolates the LAA, potentially reducing its ability to add to the irregular rhythm of the heart. 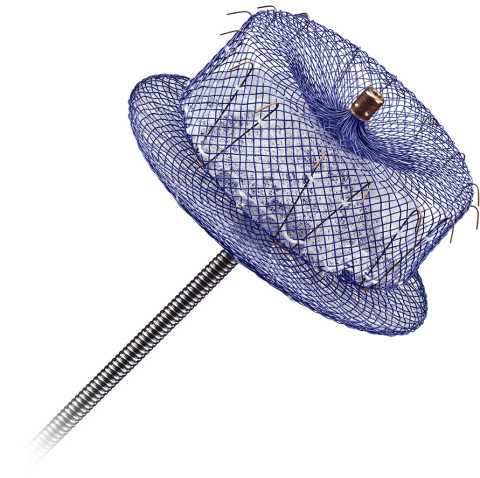 Other studies have demonstrated that the LARIAT device not only closes the LAA mechanically but can also isolate electrical activity within the LAA, a known trigger for AFib. "The AMAZE trial could help validate the mechanical and electrical isolation benefits of the LARIAT device and demonstrate that it will reduce or eliminate these electrical triggers. It may eventually become an important component in reducing recurrence in patients with persistent AFib," says site principal investigator Michael H. Hoskins, MD, assistant professor (cardiology), Emory University School of Medicine. To find out more about the AMAZE trial at Emory, please call Emory Health Connection, 404-778-7777. Emory is also the first site in Georgia to implant a new device used to seal off the LAA in patients diagnosed with non-valvular aFIB. The device, the AMPLATZER Amulet Left Atrial Appendage Occluder, was designed to reduce the risk of stroke in these patients by blocking the LAA at its opening. Currently, patients with AF at risk of stroke are often prescribed blood-thinning medication, but this treatment approach comes with a lifetime of medical management and the risk of major bleeding. "By placing the device in the LAA, it is sealing off the LAA and potentially minimizing the opportunity for blood clots to move into the bloodstream where they can travel to the brain and cause a stroke," says Hoskins, the site principal investigator for the Amulet trial at Emory. Hoskins performed the first Amulet procedure in Georgia in January 2017. The Amulet trial is a prospective, randomized trial enrolling patients at up to 100 sites in the United States and an additional 50 sites internationally. Patients in the trial will be randomly assigned to receive either the Amulet device or an FDA-approved LAA closure device in the control arm of the study. The AMPLATZER Amulet occluder, the second-generation St. Jude Medical LAA occlusion device, is built with a longer lobe and waist than the previous version and was designed to allow for easier and more stable placement, which could result in shorter procedure times for patients. The AMPLATZER Amulet device is designed to address a wider range of complex patient anatomies than other LAA occluders. To find out more about the Amulet trial at Emory, please call Emory Health Connection, 404-778-7777.